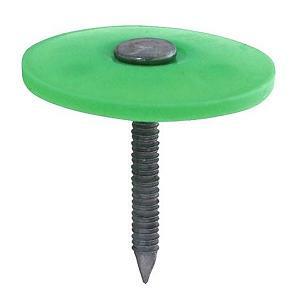 PRODUCT: 1-1/2" LONG PLASTIC ROUND CAP, RING SHANK, EG ROOFING NAILS, 2000/BOX. PRICE/BOX. 40/pallet. Order full pallets for extra discounts. Note: color of plastic cap may vary. Strong outer plastic rim on cap for increased rupture values. Ring shank nail for additional pull out resistance. Electro-Galvanized nail finish for long term corrosion resistance.